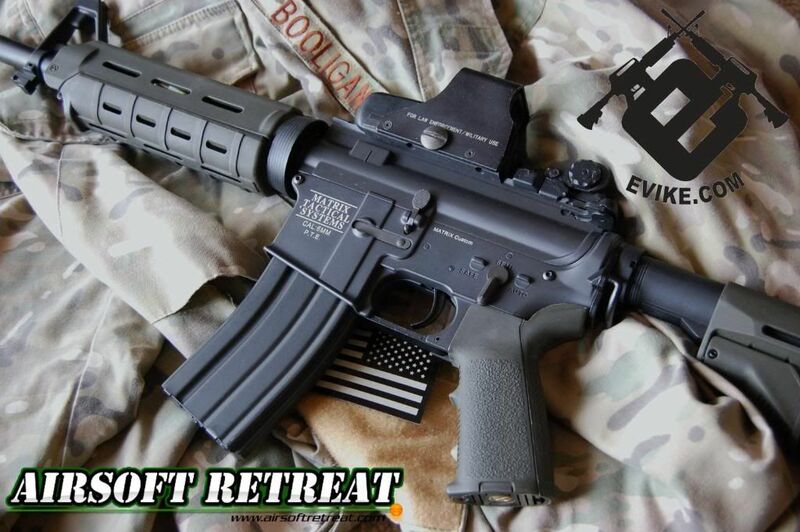 The ubiquitous M4A1 carbine is an airsoft model that has been created and recreated by pretty much every airsoft manufacturer. This AEG is the latest model from AIM and Matrix Tactical Systems, and features a great mix of parts, giving fantastic performance at an affordable price. I will go over all of the positive and negative aspects of the gun in this review, so read on, and you just might learn something! "The M4A1 carbine is a fully-automatic variant of the basic M4 carbine intended for special operations use. The M4A1 is used by almost all U.S special operation units. The M4A1 Carbine is especially favored by counter-terrorist and special operations units for close quarters combat because of the carbine's compactness and firepower. These features are also very useful in urban warfare. Although the M4 has less effective range than the longer M16, many military analysts consider engagement with a non-specialized small arm above a range of 300 meters to be unnecessary. It is effective at ranges of 150 meters or less and has a maximum effective range of about 500-600 meters." Info and photo taken from Wikipedia.org. I was browsing Evike's "New Products" section, when I came across this gun. Normally, standard M4 models don't really jump out at me as something that I'm interested in getting my hands on, but the information and pictures of the internal components in this gun are what really lit my fire. Evike and other retailers have been selling the AIM gearboxes by themselves for quite some time now, usually priced around $110. This gun features that same gearbox, an AIM high torque motor, and of course, a metal body with custom Matrix trademarks, priced at $195 for both the M100 and M120 models. The M100 model reviewed today can be found here. The gun is currently on pre-order, with an ETA in mid March for both models. I had a slight snag with my gun, as the handguard has broken slightly in shipping, but I was able to repair it using some superglue. I could have contacted Evike, and would likely be sent a replacement handguard right away, but it was easier for me just to fix the broken piece. Otherwise, the shipping using UPS Ground was quick, and even better, is free using Evike's free shipping promotion. The gun arrived in a brown cardboard box, with a sticker showing that it is manufactured by AIM Top in Taiwan, that it is the model equipped with an M100 spring, and that it has the speed up gear system installed. Inside, the gun is zip tied to an inner cardboard liner, which in my case, was broken. Some foam inside the box would help prevent damage during shipping, and would likely have prevented the broken handguard on my gun. Luckily, if it happens to you, contact Evike and they'll rectify the situation. The package includes the gun itself, a single 300 round hi-cap magazine, a manual, cleaning/unjamming rod, and a front sight adjustment tool. There is no battery or charger included, so for my review, I will be using a Kong Power 11.1v 1100 mAh 15C LiPo battery. Evike lists this gun as being "LiPo ready", which is a marketing buzzword, but the gun has been buzzing along fantastically on the LiPo thus far. This gun is a full metal replica, as everything that should be metal, is metal. I will cover each part of the gun in detail below. The receiver is made of metal, and is pretty light weight. It is finished with a dark grey paintjob, which interestingly enough, makes it look like it is made of plastic. Rest assured, it's made of metal. It is a standard M4 pattern receiver, using a left sided selector switch and a detachable carry handle. The selector switch is crisp, and has a satisfying click with each selection. The grip is a standard plastic M4 model with a ventilated, flat head screw adjustable motor base. Pulling back on the charging handle cycles the faux bolt carrier, opening the dust cover and exposing the hop-up adjustment wheel. The magazine release is also metal, and is pretty solidly mounted in the receiver, unlike some other guns I've had my hands on. Overall, it's a standard, no frills M4 receiver. No fluff, all business. Moving forward, the handguards are the next part you will encounter, which is the one part I really had problems with. As mentioned before, it arrived broken, but I was able to fix it easily. The front retaining ledge had snapped off, making the upper handguard impossible to mount. A little superglue fixed it right up, and the handguard is being replaced anyways, so I'm not concerned about it. The handguards are made of ABS plastic, which is kind of glossy black color. A little flat black Krylon will fix any paint woes you may have with the gun. The outer barrel is made of metal, and is a convertible design, allowing you to set it at several different lengths. Usually, with a convertible outer barrel, you can only unscrew the barrel extension just in front of the front sight, but with this gun, you can unscrew it there, or at the front of the M203 cutout, giving you even more length options. All of the segments, as well as the muzzle itself are threaded 14mm-, allowing you to mount damn near any muzzle device you could want. The iron sights are normal M4 items, with the rear being integrated into the metal detachable carry handle, and the front being affixed to the faux gas block. A front sling mount is attached to the barrel at the front sight, and can be switched to either side for ambidextrous use. The sights are adjustable for windage and elevation, with the rear requiring no tools, and the front using the included tool. Underneath the carry handle, you will find a standard 20mm rail, which is slightly out of spec, causing the carry handle to be a little bit loose. 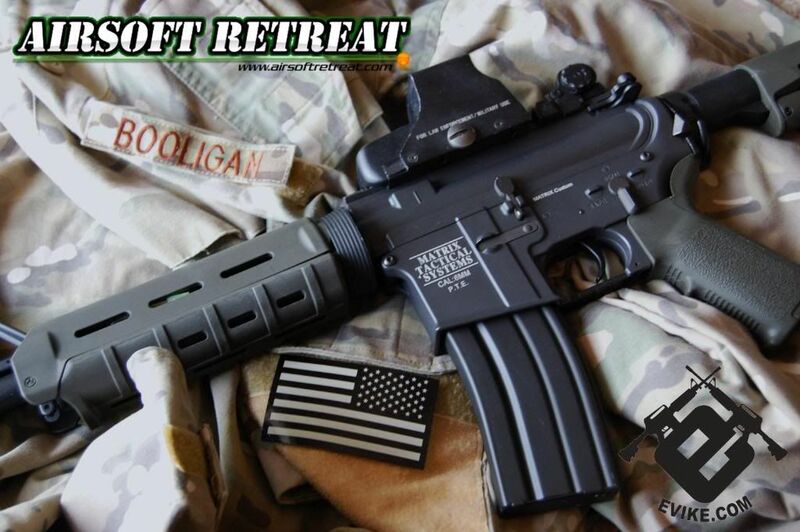 A small piece of velcro acts as a great medium to fill the gap that causes the looseness, which is why I recommend all airsoft "techs" keep some velcro strips in their toolboxes to fill gaps that cause wobbles. 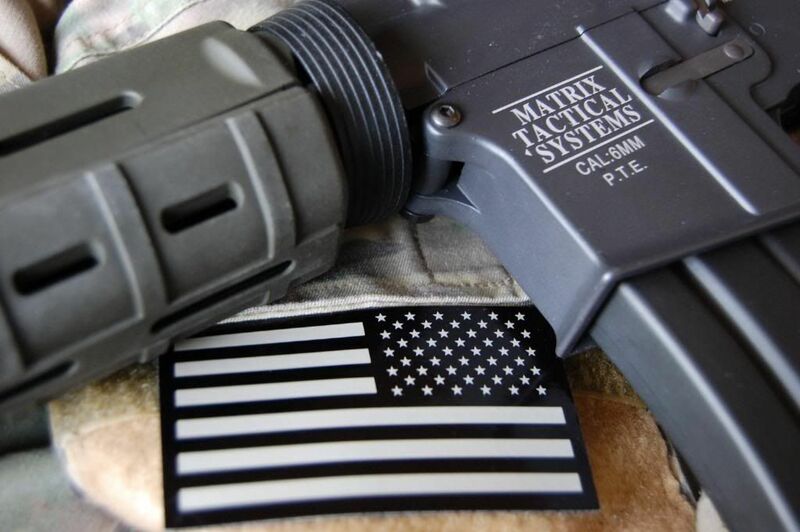 Velcro can fix wobbly stocks, receivers, and as mentioned here, sights and optics. Overall, with a few minor hiccups (broken handguard, out of spec rail), the externals are really quite nice. The metal body is well made, and isn't overly heavy, and has a unique grey color. The furniture is kind of glossy, but some flat black paint will fix that quickly. In my case, it's all getting replaced, which you'll see later in this review. One of the unique parts about this gun are the Matrix Tactical Systems trademarks. The left side of the receiver has several trademarks, as well as a sticker that states that this is the M100 spring equipped model. The stock also has a sticker on it, indicating that this model is manufactured by AIM, and that you shouldn't modify the gun. The included magazine is a metal hi-cap, holding 300 rounds. A single wind will allow you to shoot most of the rounds in the mag, so you don't need to spend half your time winding the dang thing. I tried several magazines in the gun, including JG hi-caps, MAG midcaps, ICS hi-caps, and more, and the only mag I had a problem with was an Army L85 hi-cap. It literally wouldn't fit inside the magwell at all. ROF, tested using a KP 11.1v 1100 mAh 15C LiPo battery, recorded using Audacity was just over 23 RPS. This is fantastic, considering the FPS this gun is putting out, as well as the fact that it is totally stock. It sounds very smooth when firing, with no screechy gear whine. Range and accuracy were very predictable, considering the standard hop-up components, and moderately high FPS. At 165', I was able to hit my standard torso sized target 90% of the time. It performed slightly better than some other guns that I've tested with about the same statistics and barrel length, backing up the idea that this gun has a tightbore barrel stock. Overall, I was REALLY pleased with the performance of the Matrix/AIM M4A1. It shoots hard, but not overly so, and it does it with a moderately weak spring. The ROF on a mid-level LiPo battery was great, in the mid 20 RPS range. A hotter battery would yield even better ROF. Lastly, it's accuracy and range are very consistent, and give you a leg up on many stock guns. This gun is 100% skirmishable out of the box, once you add a battery of your choice. The Matrix/AIM M4 has an AIM high performance gearbox installed, which is a $110 part on its own. Keep that in mind when you're looking at the price of this gun, as you're getting a $110 gearbox, and an AIM "F430" Magnum motor, which is normally priced at about $40 or so. The gearbox shell is decent and is set up to use 8mm ball bearings from the factory. It's not really reinforced tremendously, so rounding the cylinder window area or installing an STS wouldn't be a terrible idea if you are using a hot spring. A sticker on the gearbox indicates if it has been opened, voiding your warranty. Inside the gearbox, you'll find a metal ball bearing spring guide, skeletonized polycarb piston equipped with a steel tooth rack with the 2nd tooth removed, and a ball bearing polycarb piston head, a very long, yet not very high strength spring, stainless steel cylinder head, chrome cylinder, 8mm ball bearings, and steel high speed gears. Contrary to popular belief about this gearbox, I found it to be quite well shimmed, as it didn't have the normal "1 per side" that most guns have from the factory. Some sides of the gears had none, others had multiple, all of various thicknesses. This let the gears spin freely, with nearly no side to side wobble. There was not a self shimming device installed, which I find relieving, as I've never seen those work like they're supposed to. The bearings are kind of loose in the gearbox shell, but not to the point where I can see it causing issues. All of the non-metal components inside and outside the gearbox are made of red colored polycarbonate, and are strong where they need to be, but flexible as well. The airseal at the cylinder head was PERFECT, which is something I've only seen a few times before from a stock gun. The really unique part is that the airseal at the air nozzle was just slightly less than perfect, due to the fact that the air nozzle is equipped with an internal o-ring to seal around the cylinder head nozzle. The entire gearbox only had a slight lubricating coating, so adding some lubricant can only improve things. The gears had a very slight amount of thick, clear lube on the teeth, where it is needed, and the cylinder had a slight coating, which didn't seem to affect the airseal or smooth operation of the piston. I added a tiny amount of white lithium grease to the gears, and didn't notice any difference in performance. The inner barrel is a 363mm long, heavily crowned brass unit. It is listed as having a 6.04mm tightbore, but I can't confirm it. The one piece hop-up unit is plastic, and the bucking and nub are both standard designs. The motor is a red AIM "F430" Ultra High Torque model. The combination of high torque motor and high speed gears is popular with some technicians for its good ROF and great trigger response, as well as great durability, which most likely explains why it was installed. The wiring is fantastic, with a high strand count, and good flexibility. It is clear, so marking the positive side is a good idea to prevent accidentally mis-wiring it. It is equipped with a tube style fuse and mini Tamiya style connector, giving you a wide range of battery options. Overall, in my opinion, the internals are fantastic, especially for the price. I found no problems with the shimming, gear design, or even really the lubrication of the gearbox. Many of the things that people are complaining about with the standalone AIM gearbox, I either couldn't find, or didn't see it as an "end of the world" problem that others have reported. The spring seems like it is a little hotter than the advertised M100, and the air-seal is amazing, which is likely what leads to the 400 FPS performance. The internals should last a good, long time, even with LiPo battery usage. I wanted to build this gun into something resembling a Magpul MOE carbine, so I sourced out a furniture kit from a local retailer. The installation was fairly straightforward, except for the handguard. I needed to switch out the front ring with a different design, as the included one was a little too thick to fit the chunky MOE style handguard. Externally, this gun is pretty run-of-the-mill, but it has some great internals tucked away that give you solid and consistent performance on the field. It's a blank canvas, allowing you to modify it to your liking to fit your personal style. It's designed with function over form, and is just waiting for you to add a little style. When you say you had to change the front ring when adding the moe handguard, were you talking about the delta ring? Nope, not the delta ring, the handguard cap ring. Whatever you want to call it, it's the one that's at the front of the handguard. hi! do you know the box dimension? thank you!